There is typically a team of ecologists and one macroinvertebrate expert in each area of the Environment Agency. The teams work to monitor the ecological health of rivers across their patch of the country by sampling macroinvertebrate, fish, aquatic plants, algae, geomorphology and water chemistry (read more about the work of an environmental monitoring officer). This means we are really busy and build up a useful bank of knowledge and information about trends to help colleagues making decisions about improving the ecological health of our waterbodies through planning, pollution prevention and permit assessment. Talking with an expert at Natural History Museum recently, we realised they have lots of knowledge and training they could share with us, while we have specimens which could be useful for them. So last week, coincidentally during Invasive Species Week, our expert freshwater macroinvertebrate ecologists teamed up with ecologists from the Natural History Museum (NHM) to carry out a ‘bioblitz’ in London. River macroinvertebrate samples were taken to NHM, sorted and identified. This is all part of NHM drive to develop a national genomic reference database of freshwater macroinvertebrates that will be used to aid the development of innovative DNA based methods for exploring and monitoring macroinvertebrate diversity. This partnership builds on the expertise and knowledge within both organisations. 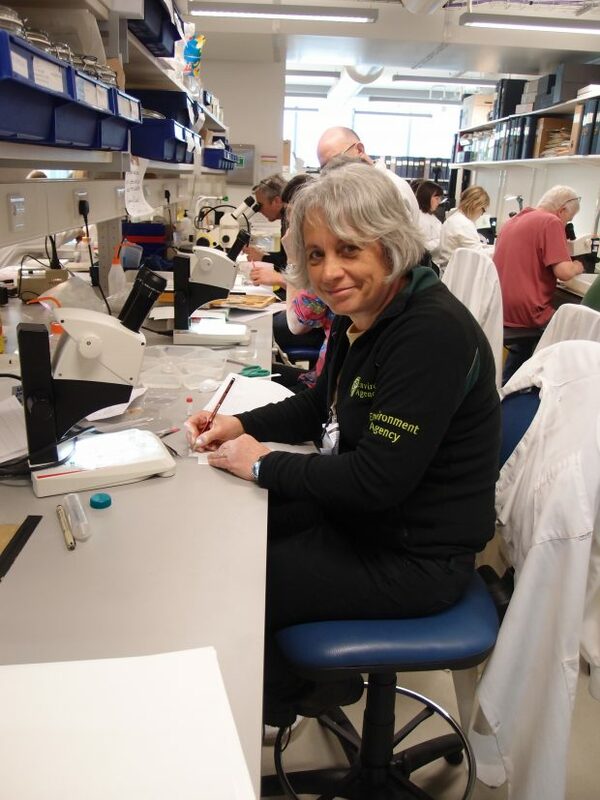 The potential to use DNA to monitor macroinvertebrates is a developing area and this provides an ideal opportunity for NHM experts to share their knowledge and expertise with our ecologists. 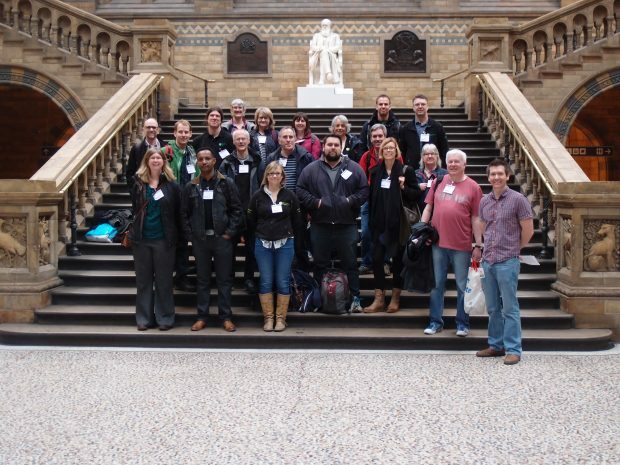 Whilst there we were able to learn from the NHM experts and share knowledge with each other. We were also given a behind the scenes tour, visiting the molecular labs, molecular storage facility and the traditional morphological collections. It was fascinating to see behind the scenes of the museum and we feel privileged to be adding specimens to the collections. I’ve been working in this role and similar roles for 15 years. I enjoy working with passionate and dedicated ecologists who want to do the best they can for the environment, it was brilliant for all of us to meet up to share our enthusiasm, experience and contribute to this project whilst meeting experts with equal amounts of passion from the NHM. 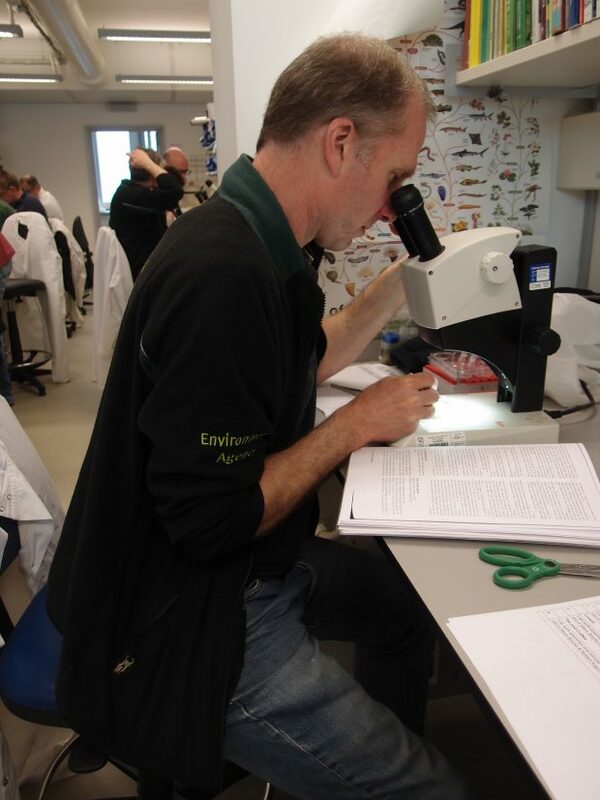 Freshwater ecologists are often out on river banks in waders doing surveys and then back at a local EA laboratories looking down microscopes to identify samples, and computers to review data, share work and plan more surveys. So heading up to the iconic Natural History Museum building and seeing behind the scenes was a really different and inspiring day. We hope this collaborative work between us and the NHM will continue as it supplies verified material for their collections and research whilst giving us access to expert knowledge to improve our skills adding to our ability to interpret the ecological health of our rivers and lakes resulting in a cleaner healthier environment for all.